Helping young children to learn what love and kindness mean, this colourful book is a gentle and uplifting read. 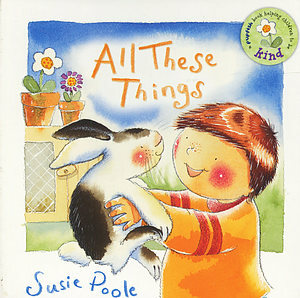 Uses text and artwork to help children discover that there is more to love than meets the eye - its about kindness too. This title is based on a Bible passage in "1 Corinthians" 13. All These Things by Susie Poole was published by Authentic in September 2006 and is our 4542nd best seller. The ISBN for All These Things is 9781904637271. A dozen full page spreads show the answers to ‘What is Love’, Hugs and kisses, ‘Yes’, but so much more. The sooner a little one has these lessons instilled into their normal behaviour and attitude, the better. This is the foundation for understanding Biblical lessons later on. Simple, clear illustrations accompanied by the minimum of words, tell the stories excellently.